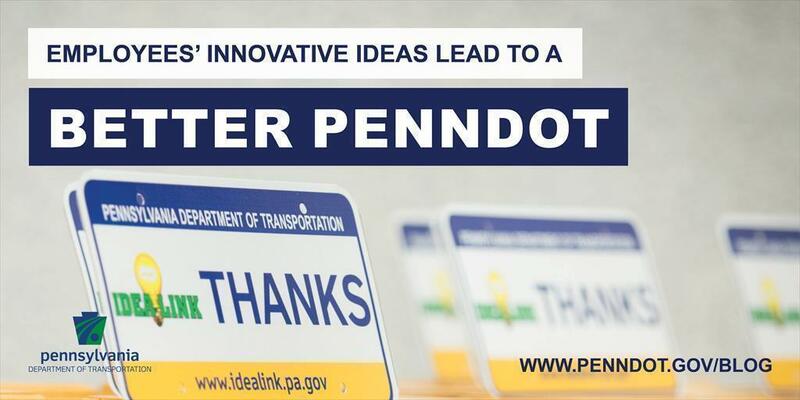 ​PennDOT's strongest asset has always been its employees, who continuously show their dedication to improving efficiency, safety, customer service, and cost savings through innovative ideas shared via IdeaLink 20/20, an online suggestion system. "We have many state employees who care deeply about their work and continually have ideas about how to do it better. We need to make sure we are listening to their ideas so that we can continue to improve how we operate and serve the people of Pennsylvania," Governor Tom Wolf said. "I want to applaud PennDOT for its efforts to engage workers in creating a government that works." Recently, 13 employees were recognized for their ideas out of the nearly 200 ideas that had been submitted in the previous year. A map of PennDOT-maintained park and ride locations was created based on an idea from Raymond Boronyak in the department's Allentown-based region. The department's interactive Posted & Bonded Roads map now has additional haulers listed based on an idea from Jill Byrne in PennDOT's Clearfield-based region. An idea from Justin Cambric in PennDOT's central office resulted in the creation of a "Transportation Programs and Projects Guidebook," which will allow users to quickly access regulations, guidance, and transportation-funding program information when completed later this year. Based on an idea from James Griffin in central office, county maintenance organizations were notified of the option to enhance employee safety by purchasing disposal kits for hazardous materials such as discarded needles found along state roadways. Posters providing resources for people who are or who know victims of domestic violence, child abuse, or human trafficking were added in all bathrooms in all 71 driver's license centers due to Harrisburg driver license employee Elizabeth Marie Hack's idea. An idea from Nancy Lee Hart in the department's motor vehicle bureau resulted in car seat safety information being displayed on digital signage in all driver license centers. Based on Interstate 95 Welcome Center employee Anne Horosky's idea, each of PennDOT's 14 Welcome Centers will begin hosting safety days in 2018 to educate the public on topics such as work zones, car seats, motorcycles, and more. An idea from Robert Lamendola in Monroe County resulted in a "Segment Offset Locator"​ website which uses the on-board GPS of mobile devices to calculate and display county, route, segment, and offset for PennDOT roadway programming purposes. A salutation on a PennDOT form was changed to be gender neutral and the department will make similar updates moving forward as needed based on an idea from Jason Kowalczk in the department's Uniontown-based region. On November 3, 2016, PennDOT held a dedication ceremony at the department memorial on Front Street in Harrisburg due to an idea from Glenn Rowe in central office. Gerald Wertz in PennDOT's Montoursville-based region suggested additional guidance to enhance employee safety when carrying heavy aggregate samples for testing. Improvements were made to the department's online ePermitting system based on suggestions from Michael Slope in PennDOT's Uniontown-based region. Additional guidance and documentation via department "strike-off letters" will be added to the department's Electronic Construction Management System based on an idea from Shaun Werner in the department's Bridgeville-based region.